Flying line. I recommend at least 30 pound Nylon or Dacron from a kite-shop. Acrylic knitting yarn is another alternative, although it's a bit thick and will keep your kite a little lower in the sky. 2-ply plastic bags, at least 0.5 meters (2 feet) wide and 1 meter (4 feet) tall. The packaging will usually mention 'low-stretch', 'strong' or something similar, if the bags are more than 1-ply. Also, they will be at the top end of the price range for the size. But they are only plastic bags, so still very cheap compared to other materials! Another clue - the lightest bags are very see-through, but the multi-ply ones much less so, with stronger color. Electrical insulation tape. Black looks nice on orange sails! Alternatively, you can try and match the colors. Hard-wood dowel, 5 mm (3/16 inch) in diameter. The ones available to me happen to be Tasmanian Oak. Red or white oak should also be OK. In the USA, apparently, Chinese Poplar is commonly available as dowel. This is softer than oak and other hard-woods so 1/4" diameter would be a more appropriate size. A ruler, with measurements in cm or inches. Scissors. Just about any type of ordinary paper-cutting scissors will do. A black marking pen. Preferably not too fine. A cheap hack-saw or fine-toothed wood saw for the dowels. These are probably the bare minimum 'tools', if you can call them that, for learning how to build kites! You can have even more fun with the bigger and better . 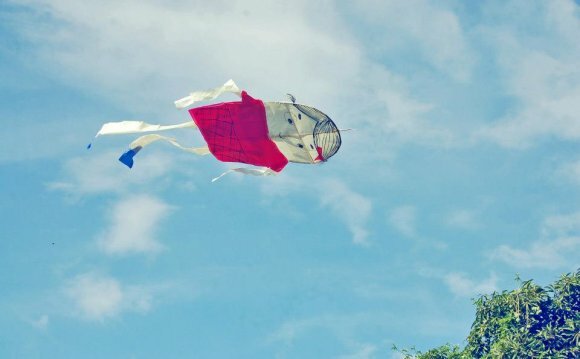 What is Good material for a Kite?